Here we are again with a Lesothan famo guitar tutorial. 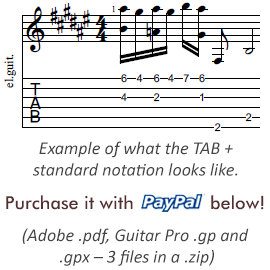 You’ll love practicing this, just click the button at the lower part of this page so you can dowload the tablature! Famo music is a very popular genre in Lesotho, but you might be familiar with it as well. Why? Well, remember the album “Graceland” by Paul Simon? Its very 1st track “The Boy in the Bubble” is in fact a Sotho famo tune; the original version was written by Forere Motloheloa, the main songwriter and accordionist of the band Tau Ea Matsekha. Paul Simon reworked the song a little and added his own English lyrics to it as well, so on the above mentioned album they appeared as co-writers. Anyway, while traditionally the main instrument in famo is the accordion, nothing stops us from playing this music on guitar. In fact, it’s one of the biggest fun experiences to pick a hypnotic Sotho shuffle on the guitar. Speaking of shuffle, the tab/sheet music of the piece you’ve heard/watched me playing above is written with a triplet feel, so it kind of swings. It’s notated in the key of D major, but it’s technically in A mixolydian mode. Yep, as usual with African music, there is syncopation, of the slower kind this time. The first section of the tune really gets under your fretting fingers like butter, once you get into the groove of it. While those string jumps seem somewhat difficult at first, they really aren’t something to worry about. They fall perfectly and naturally into the flow of the fretting hand. As I already mentioned, the piece has a triplet feel all the way through, but this part – as well as the following one – contains a triplet, too. The 2nd part is a variation of the 1st one, with a different melody line in the beginning phrase. The third section is technically a chord melody piece. It requires you to play double stops, which is a technique used quite often in African guitar music. It has a cleaner, sparser sound compared to the usually thick sounding and sophisticated chordal work of solo jazz guitar. Nonetheless, these cleverly worked out dyads can sound really colourful and rich, giving a texture sounding much more complex than what the amount of notes would suggest. Not only that, but playing just a couple of well chosen double stops on the higher strings and upper frets will make sure that your guitar part will not muddy up the low end. It’s a good thing when you have an interesting bass line going on below your part. Just like in the case of the previous sections, it’s important that you work out the fingerings that are the most comfortable to you. That’s when this dyad section will come to life. As far as the picking hand goes, it’s hard to beat the versatility of fingerstyle. If you choose to play with fingerpicks, you’ll gain the added benefit of an enhanced picking transient (attack), as well as an increase of possible playing speed. What’s not to like?